Here at MGS by Design we do everything we can to make our customers happy. 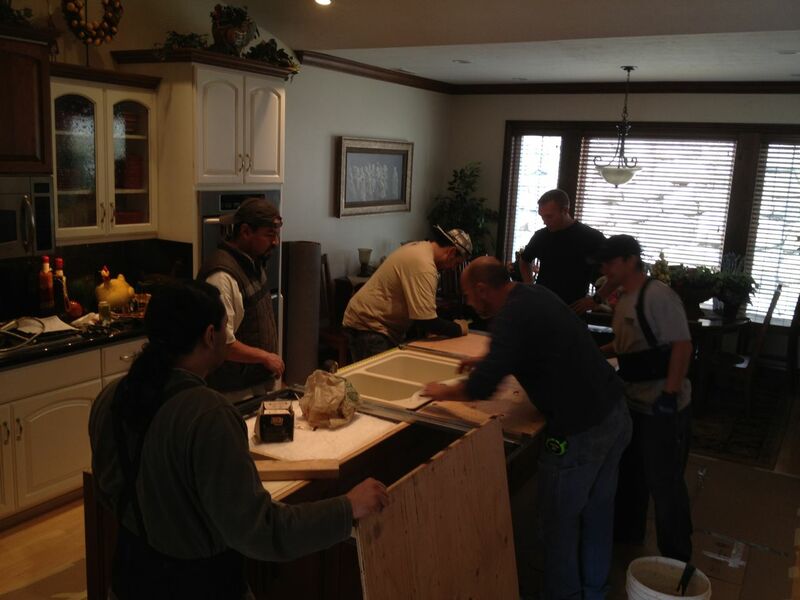 This includes building a ginormous island without a seam if that's what our customer wants! 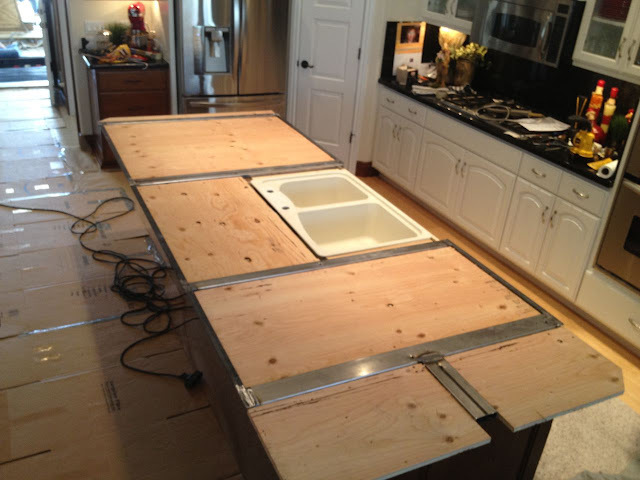 Recently we had a customer come to us with the request for an island with the dimensions of 123" long by 56" deep. The one condition...the island could NOT have a seam. 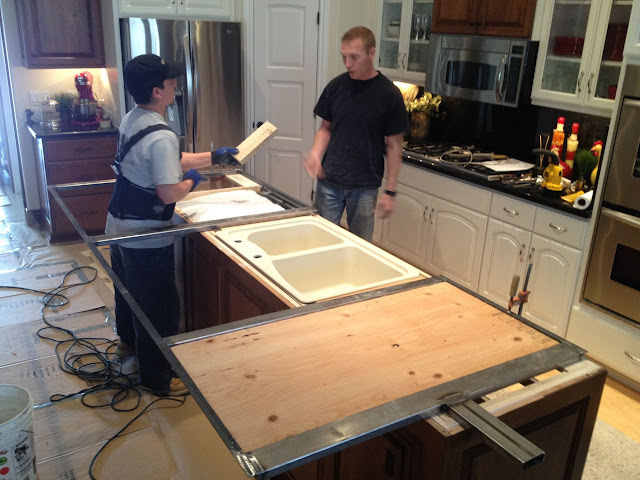 An average slab size is 120" long, and we needed at least 4 more inches on top of the 123" for laminations....so we knew this was going to be a challenge from the get-go. BJ put out a request to all of our suppliers asking what slab colors they had over 127". He found approx 5 options and then our customer was able to select from those. The homeowners were really lucky, they actually had some beautiful choices. The slab they chose was the easy winner though, it was a gorgeous slab of River Bordeaux granite from Adamas Stone. The next issue was that we had to build a frame for the island to support this huge island. One of our shop guys also does welding, so we had him build a frame out of steel and then we filled it with wood. This supported the weight and the span of the stone. It turned out pretty cool. Now, as you can imagine, this island was heavy! Probably about 1000 lbs. 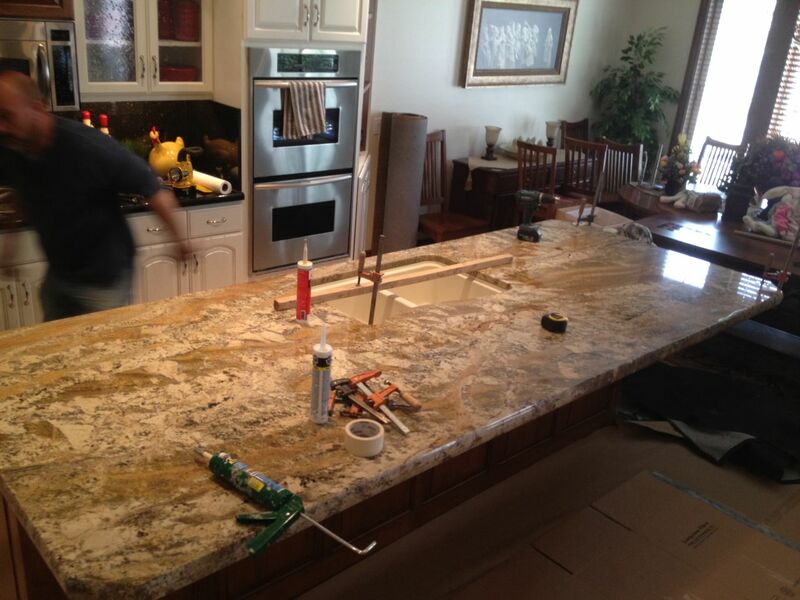 It took 9 of our guys to carry and install this granite piece. It looks pretty amazing all finished up! 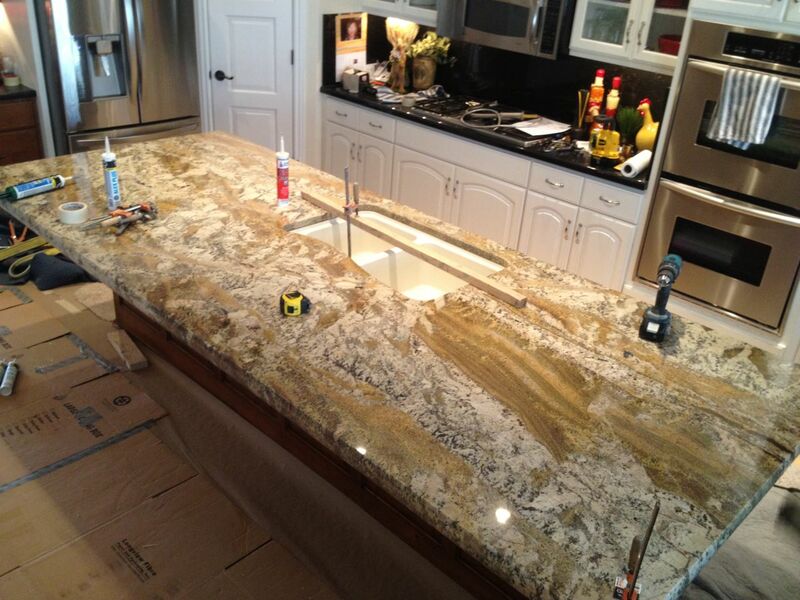 We hope our customer's enjoy their "seamless" granite island! "Hey I want to add some info about this island. 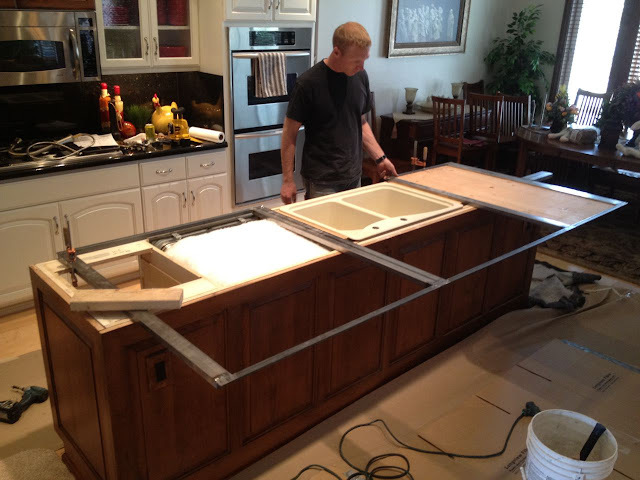 We built the metal frame because they did not want any corbels to support the island. We wanted ti to be free of knee knocking and look clean. THe actual span of the overhang is in the area of 22" and needed something that would hold some serious weight and force. The metal frame was an extra charge but well worth the free leg space underneath the island. Just another thing that MGS does to go the extra mile for our clients. These were great people and we were happy to send 9 of us to hang out with them for a while. One other funny note... The homeowner actually asked me what he should do in the even that the island fell through his floor and in to the basement below. 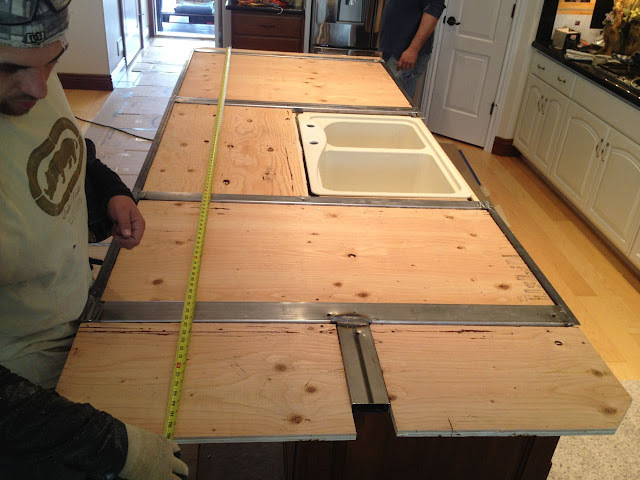 He was half joking but half serious because with a 6cm edge and that size of island you are talking well over 1200 lbs." Hey I want to add some info about this island. 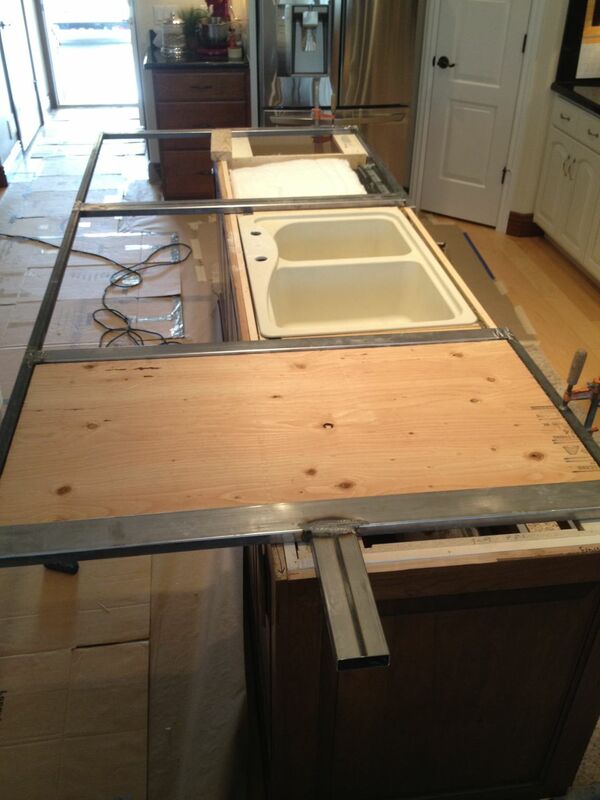 We built the metal frame because they did not want any corbels to support the island. We wanted ti to be free of knee knocking and look clean. THe actual span of the overhang is in the area of 22" and needed something that would hold some serious weight and force. The metal frame was an extra charge but well worth the free leg space underneath the island. Just another thing that MGS does to go the extra mile for our clients. These were great people and we were happy to send 9 of us to hang out with them for a while. One other funny note... The homeowner actually asked me what he should do in the even that the island fell through his floor and in to the basement below. He was half joking but half serious because with a 6cm edge and that size of island you are talking well over 1200 lbs. I really like the kitchen with granite island. Because it is always looks clean and easy to clean. Your kitchen can be looks elegant.